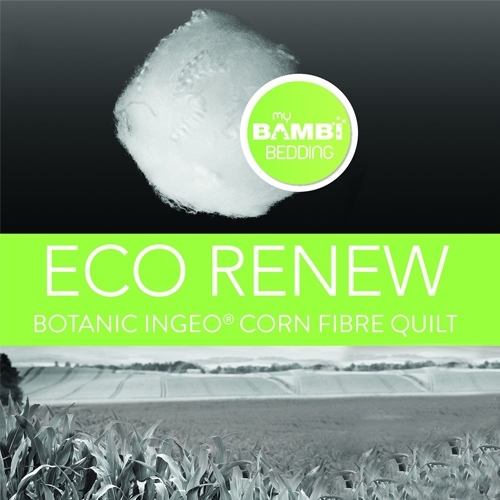 This beautiful, lightweight Bambi Botanic Ingeo Corn Whisper Loft Summer Quilt is perfect for the summer months. At just 150gsm it gives loft with virtually no weight at all. The INGEO Whisper Loft quilts are the lightest quilts in the world. Healthy and breathable, It is ideal for asthma and allergy sufferers. It is also completely natural, making it perfect for those concerned for the environment. The Quilt is 100% corn fibre fill, with a 100% Sateen Cover. It is machine washable and tumbledryable and come with 5 years warranty. Excellent for the summer months its light enough to protect you from cooler breezes, Its winter in Sydney and we have the air conditioning on in the hall way only to slightly heat the upstairs area this beiutiful light quilt just gives we anough warmth.During summer I cool our bedroom and have been using a cotton waffle blanket if it gets a little to cold I will be replacing the blanket with is lovely quilt. I would recommend this quilt for people that don't like heavy weighted covering when sleeping and at times require the protection of a blanket for sleeping comfort.The quilt also means I get to use our quilt cover all year round.